"This cake is so moist and easy! It is delicious served as a coffee cake or as a dessert. 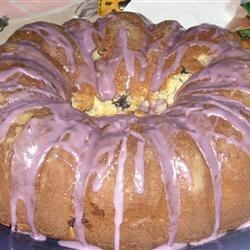 The blueberry glaze makes it a very pretty cake, too." In a large bowl, stir together cake mix, pudding mix and sugar. Make a well in the center and pour in water, oil, eggs and cream cheese. Beat on low speed until blended. Scrape bowl, and beat 4 minutes on medium speed. Stir in the blueberries. Pour batter into prepared pan. Bake in the preheated oven for 50 to 60 minutes, or until a toothpick inserted into the center of the cake comes out clean. Let cool in pan for 10 minutes, then turn out onto a wire rack and cool completely. Make Glaze: In a small bowl, combine confectioners' sugar with 2 tablespoons reserved juice from the blueberries. Drizzle over cooled cake. This was a very rich and yummy cake. I used frozen blueberries and since I did not have the leftover juice, I just made a glaze from powdered sugar and milk. It was a hit! This cake has everything. Totally delicious! I used a white cake mix, fresh blueberries, and put a lemon glaze on top. Wonderful! This is FANTASTIC! It is very moist and yummy. I did everything exactly by the recipe. I will make it again and again! This is THE best recipe! Instead of using a Bundt pan, I made giant muffins! Still used the blueberry glaze! My family loved them! Outstanding recipe!!!!!! This cake was great. It reminded me of blueberry pancakes.